Pan-fried banana on top of rice with beef? Merry Christmas, everyone! May this season brings joy and peace across the globe. 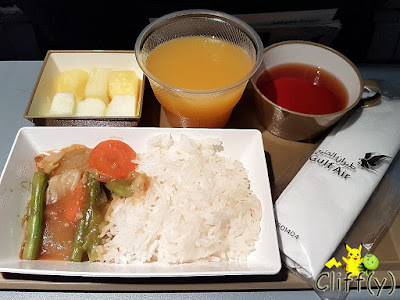 For today, let's take a look at what were served by Gulf Air, the flag carrier of Bahrain, onboard the long-haul flight from Manila, the Philippines to Manama, Bahrain. Pikachu had no choice but to unfasten his seat belt to enjoy his meal, despite the sign shown on the screen. I had orange juice to quench my thirst. My BFF asked for apple juice, but it wasn't available. It was an incomplete Waldorf salad comprising celery, apples and raisins. While the ingredients were of adequate freshness, I found the dressing to be somewhat heavy, so much so that it felt cloying towards the end. The fish was pretty succulent, although I felt that the mushroom sauce could be more flavourful. It was accompanied by ratatouille and mashed potatoes that could be more velvety. 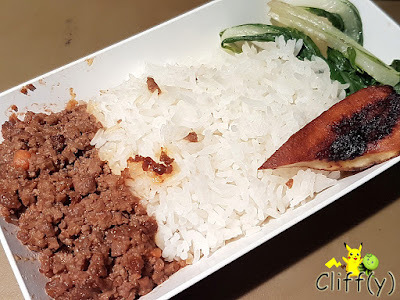 I enjoyed the minced beef more as the red meat was juicy and tasty, alongside vegetables that still retained their crunch. Something unique was the inclusion of pan-fried banana, which was somewhat dehydrated, yet sweet and fragrant. Dusted with castor sugar, the pound cake was leaning more towards the light and airy side. Having said that, the aroma of vanilla could definitely be stronger. I didn't quite like the sight of nitrogen-packed bread onboard, but it was fluffy alright. No cheese served, but each passenger was given a packet of cheese crackers that were nicely savoury. 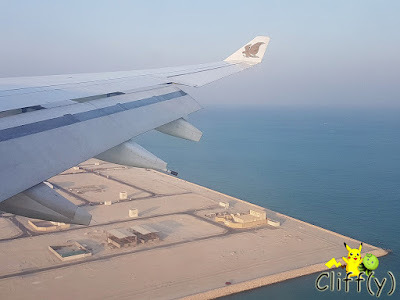 I don't think Gulf Air is a dry airline, but I didn't see any alcohols on the trolley. Anyway, all I wanted that afternoon was a cup of cold Coca Cola. 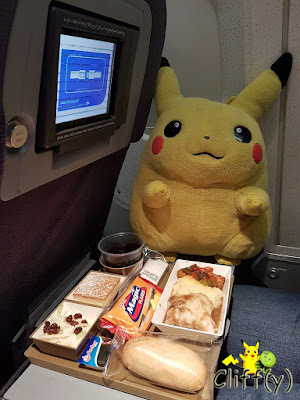 Pika's advice: While coffee and tea were also available, the flight attendants didn't make rounds to offer those after distributing the meal trays. You have to ask. 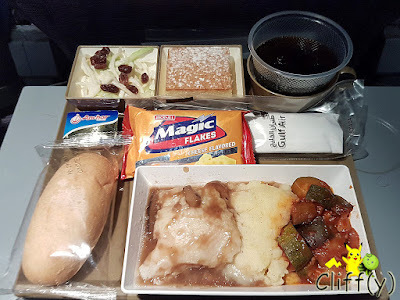 There wasn't any options communicated by the flight attendant for the second meal service. The cabbages, long beans and carrots were stir-fried with lots of garlic, which were appetising. Some of the rice grains were a bit hard though. The honeydew and pineapple cubes were pretty sweet. I requested for a cup of orange juice to freshen myself up, as well as a cup of tea to end the meal. 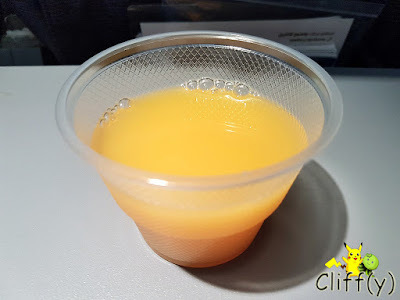 There wasn't any snacks available mid-flight, but I recall the flight attendant serving my side coming with mineral water twice in between the two meals. *No separate price given as meals are included in the ticket price.